I just wanted to share with you a concern I have about a particular video game I played, called Homefront. . It's basically an alternative view of reality where North Korea unified both North and South when Kim Jong-Il died and his son took over. The thing that concerns me is its portrayal of North and South Korea. It sort of views South Koreans as some sort of evil people capable of overtaking the world or something. I wouldn't think that South Korea would even think about harming an American citizen, much less agree to harming Americans as a whole. I think as part Korean, I'm a bit offended by this game and its message, but I wanted to ask you what you think? My view and thoughts of South Korean is that that they don't want nothing but the best for Americans and I'm a bit surprised that the developers of this game would think that they would take a different stance. The short answer is: the Korean does not think much about the game at all. This is a good place where one of the Korean's life principles works very well -- that is, "worry about what reasonable people think, and forget about what unreasonable people think." No reasonable person would let this affect his/her perception of the actual nation of Korea. Besides, even within the game's setup, South Korea is portrayed as overtaken by North Korea anyway. Let's not worry about things that do not matter. 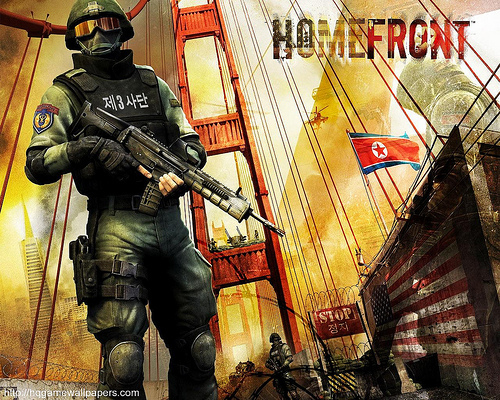 The only thing that the Korean might find offensive about Homefront is the highly likely possibility of totally butchered Korean language in the game, but that's just him and his own peculiarities. First person shooter is not the Korean's game, so he won't be finding it out at any rate. - As expected, this game created a small controversy in Korea, especially because an executive of the game company THQ said, through its sinking of ROKS Cheonan, North Korea had been "really cooperative" in selling the game's world, and he "really appreciate[d] the regime in North Korea for supporting Homefront the way they have." Obviously he was joking, but it is still pretty tone-deaf to joke about an attack that killed 46 people less than five months previous. - The game is currently banned from Korea, but not because of the reason you are thinking. It is not selling in Korea because it was never submitted to the Game Rating Board of Korea to receive a rating. Of course, the Korean thinks there is a solid chance that it would not receive a good rating (say, 13-years-old and up so that it could sell more) even if the game is submitted, but that's just speculation. - Is Homefront even remotely possible? The game's plot works mightily toward creating a shred of plausibility, but it is pretty laughable to anyone who knows anything about North Korea. Right now, North Korea would not even be able to handle South Korea even if South Korea voluntarily submitted itself to North Korean rule. Also, apparently the decline of America through dramatically reduced supply of oil is a big factor in Homefront. This is doubly stupid because (1) South Korea depends on foreign petroleum to a much, much greater degree than the U.S. (as South Korea imports 100 percent of its fuel,) and (2) South Korea's economy is hugely dependent on its export to the U.S. This is not the only case of the US entertainment industry trying not to offend China. The remake of "Red Dawn" was originally supposed to feature the Chinese antagonists, but they are digitally changing all hints of a Chinese takeover to ... North Korea. Yeah, a starving population of 20 million is going to occupy the US. It's about being politically correct, but I also think it's about money: China's box office is lucrative, and a lot bigger than North Korea's. Hollywood loves to make films that are ready to be exported as soon as they're completed. Video games, in my mind, have a certain level of immunity to good, believable stories, because they originated as completely brainless. Even if this game's plot is stupid, the game itself may have excellent game play mechanics. On the other hand, it's hard to imagine a Red Dawn remake with any redeemable qualities whatsoever. Having played this game I think it's main ploy is that it appeals largely to a patriotic American. It's common in movies as it's an easy way to garner sales. The plot has way too many flaws however, and to be quite honest I was rather disappointed in the game itself, as well as the story. As for the Korean language parts, they seemed fairly accurate, although there were a few cases where formal language was used when it was not needed and vice versa. Thanks for the balanced post, TK. The title is somewhat provocative, though - as Phil noted, it is just the studio minding the bottom line, i.e., whether they will be hurting the sales of the videogame/move/whatever into China. I personnaly think Chinese people (or Korean people) shouldn't really be offended by Chinese (or NKoreans) being depicted as adversary - it is just a fiction. As long as the characterization is not one-sided and mindless to exhibit true racism, people should just let it go. I would also point out a big-budget video game with Chinese invasion of the US - Fallout 3. On the subject of being offended by portrayals of certain people (and to be slightly off-topic), I do wonder what the Korean thought about the whole issue about Hetalia... it's been two or three years (old news is old), but the whole thing just kind of left a bad taste in my mouth. It gets really difficult to determine what is just creative liscence/"get over it it's not real" and what is actually offensive. Does the offensiveness of a material depend on the creators or the intended market, or can it be something objective? Maybe I should have e-mailed you instead, but old news is really old to be asking. I can understand why Koreans or Chinese would be offended by these games. It may seem brainless, but you can't help but feel a little uncomfortable seeing gamers casually "kill" Koreans or Chinese with glee. Remember when Americans spazzed out when the recent Medal of Honor game was rumored to have a level where the player controls a member of the Taliban killing US soldiers? In a way, Vierre, that's a disappointment, if the story is just a patriotic self-satisfaction effect. I see a lot of "Video games are crap" arguments, but I tend to assume they can be as good as TV at least in storytelling-- IF DONE WELL. There's nothing wrong with speculative histories, either-- as long as it's coherent. That's half the fun-- seeing how the writer has made the premise work. Give me a good reason for the DPRK to hold San Francisco, and I'll suspend my disbelief. But if you're doing a weak story-- to the point you can interchange China with Korea and the game works the same-- you're not living to the medium's potential. Now, a GOOD alternative-history telling of the same premise, I'd enjoy reading/watching. Maybe the US doesn't intervene in the late 1940s; China never gels in that area, and you've got Kim Il-Sung creating a regional empire that tilts the balance of the cold war. Interesting comments, and I have to say I would still like to see the game (though not play it). The US has already reached, and passed peak oil. In other words, there is less oil in the US than has been extracted. This means that homegrown oil will be harder to find and extract. The US will soon be relying on 100% foreign oil as well. It's just a matter of time. I did a review on Homefront as well.Im suprised many people believe this could happen.